There is a warning that appears at the beginning of many Scott Joplin piano rags. I remember seeing this in high school when I was learning a lot of the pieces. It is a note from the composer himself, admonishing pianists not to play the piece fast, that it is never correct to play ragtime fast. I do something like this with my DVD releases. I don’t know how effective it is, but at least I’m letting viewers know the intended viewing procedure. I release a couple of DVDs every year, sometimes more and sometimes (like this year, probably) less. Every year, as more and more people replace their TVs and watch what they watch on widescreen 16:9 sets, I wonder how many people watch classic films stretched out. And so I contact one or two people I know at other “big” DVD/Blu-ray production or distribution companies whom I’m friends with and check the temperature of the water. My question: are classic films still being released on DVD in a 4:3 aspect ratio, or is the norm now to “pillar-box” them the way they’re shown on TCM? The answer has always come back the same — “yes”. If that’s what every else is doing, if that’s the Industry Standard, then by gum that’s what I’ll do. Well, I do one thing that is not an industry standard and I don’t think anyone else does, and I’ve done it for every DVD release I’ve put out. I’ve taken a cue from Scott Joplin and let people with 16:9 TVs know the intended way the films are supposed to be viewed. Even if they can’t tell the difference, and many people can’t (ever try watching TV in a hotel? ), I want fans to know it’s never correct to play ragtime fast. If you know the difference between watching at 16:9 and at 4:3 you’ve probably already set your aspect ratio, or perhaps for you this is a gentle reminder to grab your TV’s remote and make the adjustment. But, if not, if you’re one of many many people who don’t notice the stretch in film or video when it happens or who think everything is fine as long as the image fills your screen, the rectangle vs. square analogy might help. Like Joplin, I have no control over this. There were clearly people playing ragtime as fast as they could or wanted to in the early 1900s, but at least he was able to convince his publisher to remind folks buying the sheet music — even though there were markings like “slow march tempo” right at the beginning — that, really, you need to hold the tempo down. I know…most ragtime, whose popularity hit in the parlors of red light district abodes, was being played at whatever rapidity the pianist favored. Joplin’s intent was to elevate the form to that of classical music, and this note from him was part of this effort to take the music seriously. But I think you get my point. 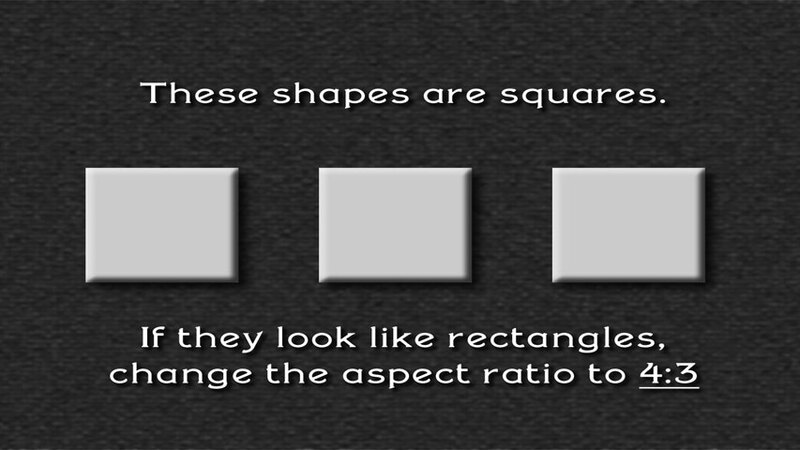 To loosely paraphrase Shakespeare, a square by any other aspect ratio is a rectangle.